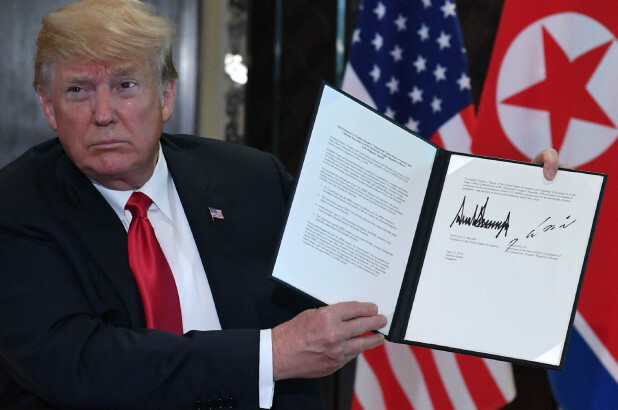 President Trump and North Korean leader Kim Jong Un signed what Trump says is a “very important” and “pretty comprehensive” document after their Tuesday Summit in Singapore. However, after signing it, Trump held up the papers for photographers – and the agreement was briefly visible. That the nations will work for a “stable peace” on the peninsula. Earlier in the day, Secretary of State Mike Pompeo defined security guarantees for North Korea as “sufficient certainty that they can be comfortable that denuclearization isn’t something that ends badly for them”.